Tony and I have such gratitude for our beautiful life together and for our family and friends who add so much to our lives. We are thrilled to invite you to be part of vow renewal ceremony at The Sheraton Kauai Resort! 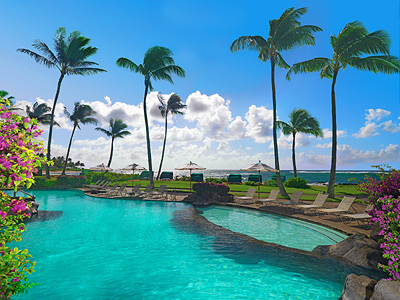 This Hawaiian getaway at Sheraton Kauai promises an unforgettable experience in the tropical charms and exotic luxuries of paradise! This soothing sanctuary boasts sumptuous settings in all accommodations, tantalizing cuisines, an array of thrilling activities and a place of peace and calm in the spa. Exploring the enchantment and mesmerizing beauty of the islands on this Hawaiian holiday is a wonderful gift! With your lovely gift the experience on this trip of a lifetime at Sheraton Kauai on will be unforgettable! Here, the true essence of the islands will be discovered with lush natural beauty, pristine beaches, sparkling waters and the welcoming spirit of "Aloha". Sheraton Kauai boasts enchanting accommodations, world-class restaurants, thrilling activities, and a world of tranquil bliss in the spa. A stay at Sheraton Kauai will be an exceptional island getaway that is just as alluring as it is mesmerizing! With your thoughtful gift it will be time to enjoy a sumptuous treat in the tranquility of the suite! A bottle of chilled Moet Chandon Imperial Rose Champagne accompanied by dried pineapple will be delivered to the room for the ultimate indulgence at Sheraton Kauai! On this once in a lifetime Hawaiian vacation, it will be time to take delight in the simple luxuries of paradise at Sheraton Kauai. In the comfort of the suite a bottle of Moet Chandon Brut Champagne and delicious dried pineapple will be delivered to the room. At this lavish resort sweet indulgence of paradise will be discovered! Thanks to your lovely gift an exceptional bottle of champagne will be waiting in the room! In the charming settings of the suite a bottle of Sheraton Kauai Champagne will be savored with the flavors of sweet dried pineapple. Thanks to your lovely gift, we will experience the special indulgence of the Couples Massage at the Hawaiian Rainforest Spa! While lying side by side at the Hawaiian Rainforest Spa's outside cabanas, we will be pampered with long soothing massage strokes and fragrant essential oils to calm the mind and relax the body. We will listen to the sounds of the ocean and feel the gentle tropical breeze rolling across our skin while discovering pure bliss! With your generous gift, it will be time to enjoy the fruit and cheese amenity on this vacation at Sheraton Kauai! An array of cheeses including Baby Brie, Boursin, Gouda and Babybel Cheese served with Kauai Lavosh, Kauai Granola Tropical Mix and dried pineapple will be delivered to the room. The flavors of paradise never tasted so good! Sheraton Kauai boasts pure bliss in the calm surroundings of the Hawaiian Rainforest Spa's outside cabana! With the Hawaiian Lomi Lomi Massage, the body will be massaged with fragrant essential oils of the island, incorporating rhythmic touch and soothing techniques. This luscious massage will awaken the senses and rejuvenate the mind, body and soul! A lavish Hot Stone Massage is the perfect gift for this tropical getaway at Sheraton Kauai! In the peaceful settings of the Hawaiian Rainforest Spa, the therapist will apply smooth, warm stones to key points of the back, using long soothing strokes to help achieve deep relaxation. This luscious massage will leave all who enjoy it in a tranquil state of bliss in paradise! A decadent treat will be delivered to the room. Once this delicious amenity arrives it will be time to take delight in an array of chocolate, strawberry and whole milk coconut macaroons and macadamia nut cookies finely accompanied by two glasses of milk. Milk and cookies in paradise never tasted so good! This tropical getaway at Sheraton Kauai offers an exceptional bottle of Moet & Chandon White Star! In the comfort of the room, it will be time to savor the harmonious sensations of this divine Champagne and admire exotic views of the surrounding lush paradise! At Sheraton Kauai, the Na Lani Mea Massage on this Hawaiian escape will be the perfect gift! In the tranquil settings of the Hawaiian Rainforest Spa's outside cabanas, the mind and body will delight in a relaxing full body massage customized to fit specific needs. Discovering a world of peace and calm with the Na Lani Mea Massage will be an unforgettable spa experience! On this tropical escape, indulging in the Royal Delight Package will be an unforgettable spa experience! At the Hawaiian Rainforest Spa, a lavish array of spa treatments will soothe, nourish and calm the mind, body, free spirit and soul at Sheraton Kauai! This tropical getaway at Sheraton Kauai will be enhanced with an ATV Tour! Traveling down winding trails and pathways, all who participate will enjoy the exotic surroundings of Kauai. Offering stunning views of the Pacific Ocean and the enchanting natural charms of this island paradise, a thrilling adventure on ATV's will be an exhilarating experience! Taking part in the helicopter tour on this Hawaiian vacation will be an excellent adventure. This tour includes flying high over the Garden Isle to witness breathtaking views of the majestic mountains covered in lush foliage and the stunning vistas of the shimmering Pacific Ocean. Thanks to you, the beautiful scenery of this luscious island paradise will be discovered from a bird's eye view! The Kayak Tour will be an amazing experience! There will be a choice to kayak through the shimmering waters of the Pacific Ocean or along winding rivers. This gives an opportunity to experience the breathtaking coastline or the dense, lush tropical beauty of the Garden Isle! Sheraton Kauai presents the opportunity to take part in the Zipline excursion! This includes soaring high above the treetops while viewing lush foliage, winding streams and cascading waterfalls from a bird's eye view. There will be many memories made while enjoying this exciting, thrilling adventure on Kauai! 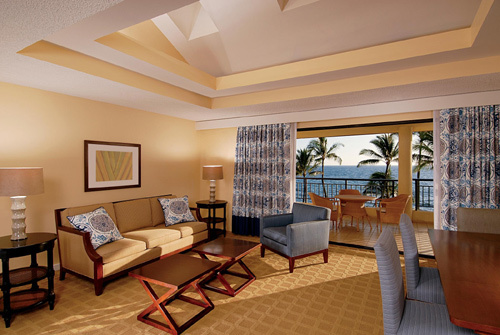 At Sheraton Kauai it will be time to indulge in the surroundings of the Partial Ocean View Room! This room is beautifully designed with exotic decor, tropical hardwoods, fine furnishings and a spread of warm neutral colors. This Hawaiian haven features a king size bed with lush linens, lavish amenities in the bathroom and stunning views of thriving gardens and the sparkling Pacific Ocean from the private lanai! Thanks to your thoughtful contribution, the charms of paradise will be enhanced! The Deluxe Ocean Front Room is beautifully decorated with tropical design, deep hardwood accents, fine furnishings and accents of fresh whites and creams. This room boasts comforts, a king size bed with delicious linens, lavish bathroom amenities and a private lanai with breathtaking views of the beach and pool! The Ocean Luxury Room boasts irresistible settings! This tropical retreat is beautifully designed with Hawaiian decor, exotic hardwoods, fine furnishings and a crisp canvas of fresh whites and creams. This spacious Ocean Luxury Room boasts a king size bed with luscious linen bedding, abounding bathroom amenities and a private lanai with breathtaking views of the majestic Pacific Ocean! With your lovely gift, it will be time to discover the elegance of paradise at Sheraton Kauai! The Ocean Front Suite is luxuriously designed with a scheme of warm colors that enhance the exotic decor, dark hardwood accents and fine furnishings. This spacious suite boasts a king size bed with plush bedding, generous bathroom amenities and an oversized lanai with exotic views of the azure Pacific Ocean! The Deluxe Ocean Front Suite boasts elegant surroundings! This spacious sanctuary is decorated with tropical design, deep hardwoods, fine furnishings and is accentuated with rich creams and powder whites. This stunning suite offers a king size bed with lush linen bedding, abounding bathroom amenities and a private, spacious lanai with exotic vistas of the majestic Pacific Ocean and pristine beach! 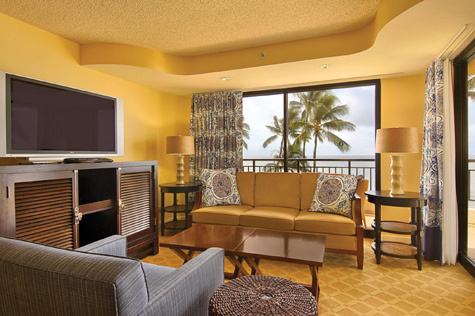 The Presidential Suite at Sheraton Kauai will enhance this Hawaiian getaway! This paradise is luxuriously designed with Hawaiian decor, exotic hardwoods, and fine furnishings that are complimented by refreshing creams and crisp whites. This spacious Presidential Suite promises a king size bed with luscious linen bedding, exclusive bathroom amenities and an expansive private lanai with enchanting vistas of the rugged black lava coastline and the alluring waters of the Pacific Ocean! Indulging in an enchanting island dining experience on this Hawaiian escape is a lovely gift! Lavas Grill and Bar boasts a charming atmosphere with mesmerizing oceanfront views of Poipu Beach and the famous First Break Surf Spot. Choose from a selection of freshly grilled specialties and a menu of refreshing drinks and enjoy tropical breezes while unwinding in the relaxed settings of Lavas. Sheraton Kauai offers a remarkable dining experience at RumFire for this once in a lifetime vacation. This restaurant serves a delightful buffet for breakfast and offers an extensive dinner menu of distinctive cuisine with an island twist including freshly caught seafood specialties and prime cuts of meat. With impressive wine and cocktail selections it will be time to toast to the charming ambiance of RumFire!